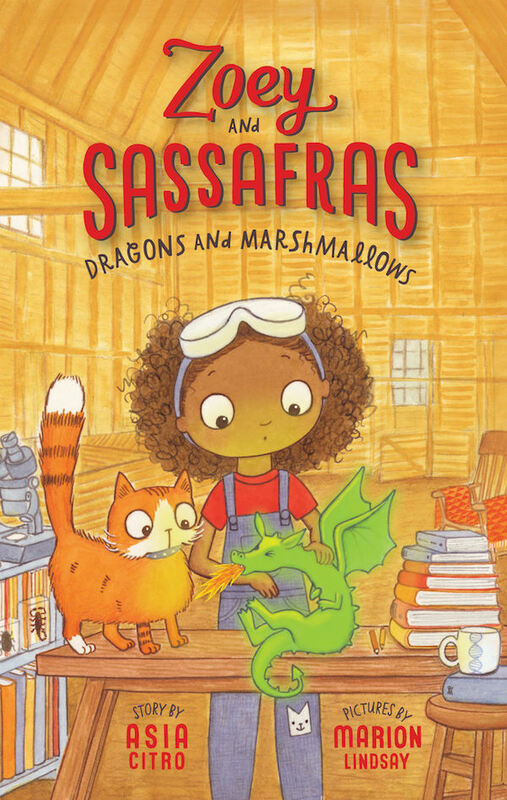 The series is about an adorable little girl who uses scientific thinking to help magical animals. I love how empathetic and kind-hearted Zoey is as well as how determined she is. Despite problems that arise, she persists with her mission to help! Why would a little girl need to help magical animals you wonder; well, it seems not everyone can see them. In fact, only a few people can see them even in photographs! How do you know if you are one that can see them? They glow. Easy enough. Zoey even thought taking pictures of the magical animals would be one of the best parts! So to go along with this enchanting book we wanted to make some pictures of our own magical creatures. 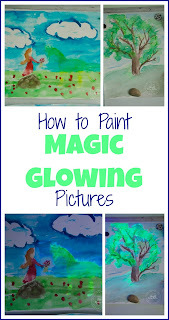 And we wanted to make them glow! Before you start making magic you have to spend some time thinking about what kind of magic creature you want to appear and they setting it will be in. Since only green and yellow highlighters seem to glow under a black light, really we tried them all and only had luck with those two color, those will be the colors you will want to disguise with as well. You aren't going to want to put a yellow creature in a blue ocean unless you are adding some green to the water as well since blue and yellow make green. One of the great things about drawing a magical creature is that it is all from your imagination. You can create whatever type of animal you want to fit the scene you want to paint! If you decide to skip this step and just start drawing you will likely find in the end your hidden picture is not very hidden at all. But it will still glow which is pretty cool. 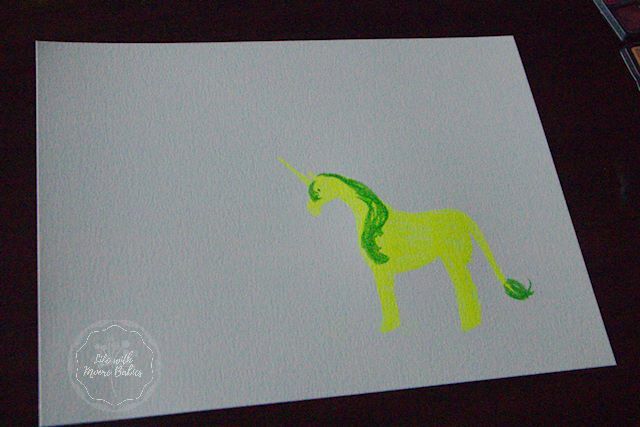 Now that you have a plan in mind, you will want to start drawing your magical creature with a highlighter. 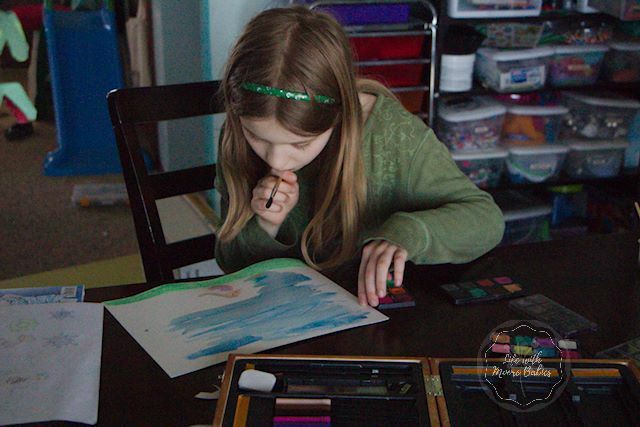 Now that you have a lovely green or yellow creature on your paper, it is time to paint. 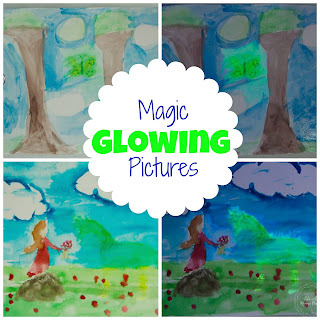 I used watercolors for the remainder of the pictures because they are thin enough that the highlighter can still be seen through it. 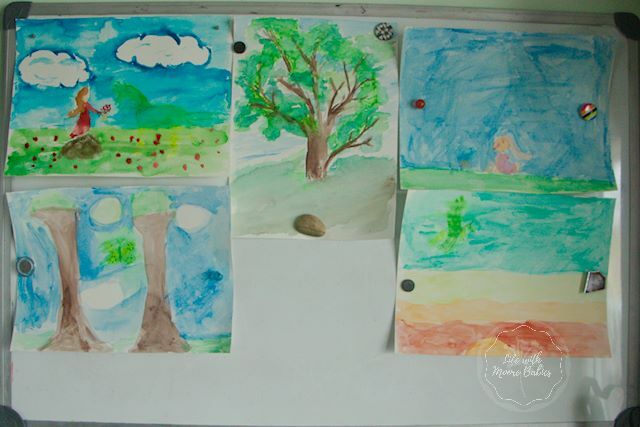 However, since you need water for watercolors, the highlighter also spreads a bit when you paint. I didn't mind the spread to a point as it just provided a glowy effect like magic, but if you get too much spread you end up with a glowing blob. No point in drawing an awesome magical creature if you are going to turn it into a blob. When painting over your animal, always paint towards the center of the animal rather than away from it. 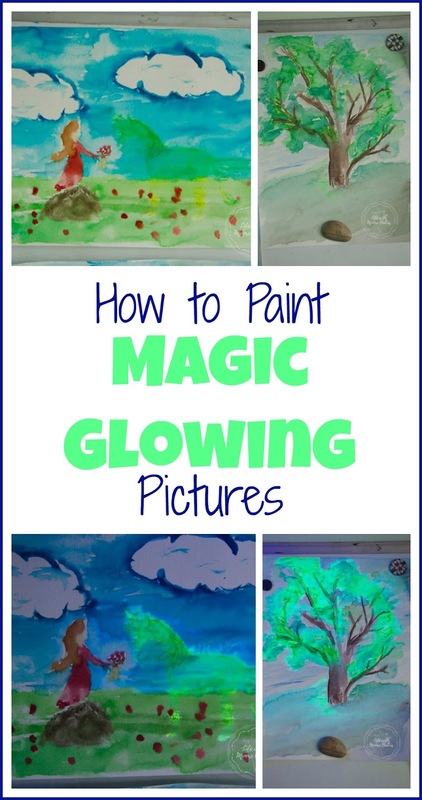 Remember when designing the picture, you want your highlighter hidden from view in regular light for all those people who cannot see the magical animals. After you have disguised your creature in an ordinary picture you simply wait for it all to dry. Be sure to leave it flat, so none of the paint will run! Now comes the best part. Once your painting is dry you need to find an unsuspecting audience, little siblings or grandparents, you know people who don't normally see magical animals. 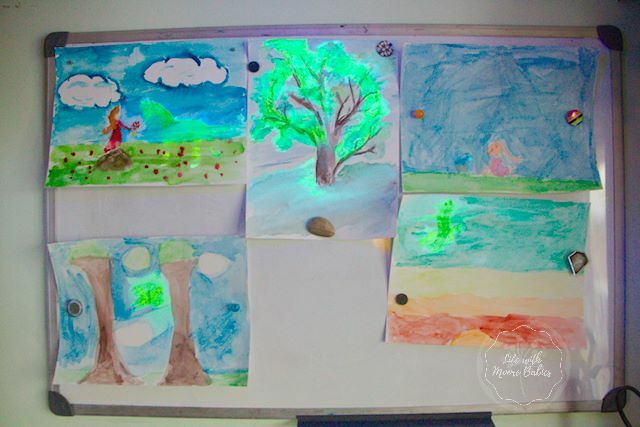 Start by showing them the picture in regular light (above) and then under the black light (below). You're sure to hear, "wow" or "amazing" when the magical creature glows back at them from the paper. Science! I love how the scientific method is emphasized. Magic! Fantasy books grab my kids, so the inclusion of magic increases their interest. Adorable story and a happy ending; I love happy endings. 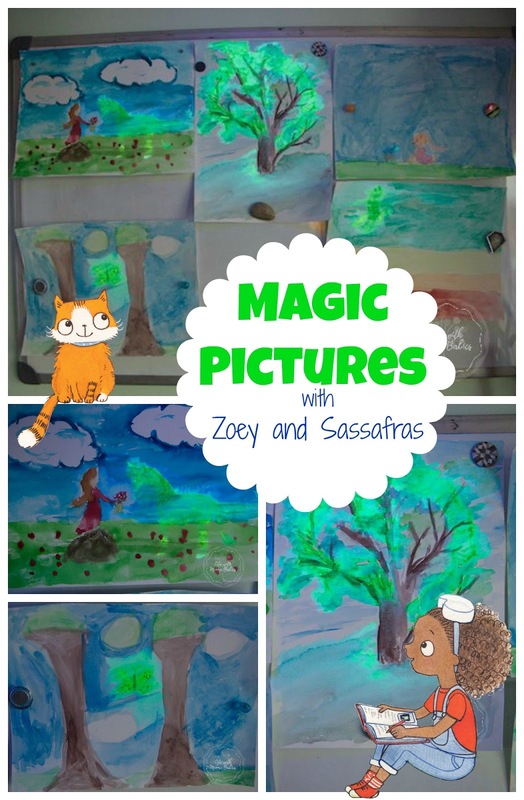 Whether your kids love books, science, magic, or all three, they are sure to love the Zoey and Sassafras series and creating their own magic art with glowing pictures! Also, the author and illustrator both love to get mail from kids who love their books. 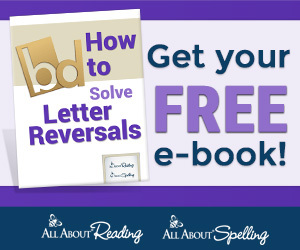 Find out how to write to them here. 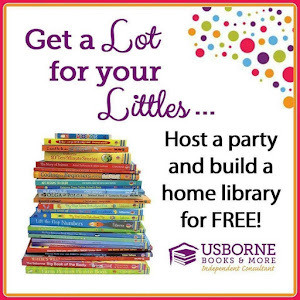 And don't miss out on the rest of this amazing series!